it seems like the dream job - being whizzed round france in july along with one of the finest cyclists of the last few decades, to commentate on the tour de france. undoubtedly the reality lacks the glamour of the ideal, but over the past few years, for those of us on the receiving end of british eurosport, the pairing of david harmon and sean kelly has been our company for 21 sunny days of mellow johnny. we know probably everything we're going to know about sean kelly; there is hardly a dearth of the printed word concerning the tour's frequent green jersey wearer, but what of the man who sits beside him, and who, on a majority of occasions is our only voice on eurosport's cycling coverage? you seem to have been a part of the eurosport commentary team for ages. how long has it been? I started by covering three days at the end of the 2002 Vuelta a Espana. 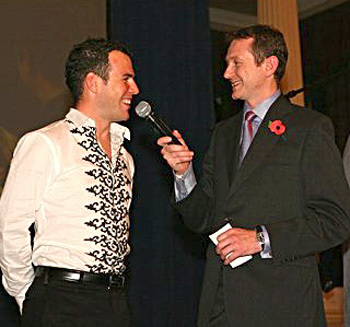 David Duffield (Duffers) had been the voice of Eurosport for over a decade and I think they were a bit nervous about trying out a new boy. Luckily they left me in charge of the commentary box during a really thrilling three days. Coming back to cycling was another piece of happy chance, I sent a showreel of my motor racing commentaries to Eurosport but Duffers noticed I'd been a bikie and hauled me in to have a go. We got on like a house on fire, I think a shared passion for driving minis and good single malt helped. We've always planned to take part together in the 'Tour of the Malts' classic rally in my 1956 Morris Cowley but sadly it always clashes with the Giro. you seem particularly knowledgeable about the history and architecture of many of the cities and towns of europe. was this formal study or plain old interest? My first love was archeology and I worked as an archaeologist before I decided to have a serious crack at racing mountain bikes. Sadly it's a poorly paid if wonderful profession and something had to give. I always intended to go back to it full time but it's funny how life turns out. on scott coady's movie 'it's cobbles baby' a conversation with sean kelly had subtitles. do you ever have any problems understanding the man in the commentary box? since commentating isn't a club with too many members, do you get on well with anthony, brian and duffers? Duffers is my hero. He always said remember it's not just about the diehards, it's about commentating for the 'widow woman in Wigan'. Many have tried to emulate him and that's a big mistake. Brian and Anthony are a great pairing and I love Brian's dour wit on the box. I don't see as much of them as I'd like. Hey, maybe we should all start a team? any preferences between the single day classics and the big tours, from any point of view? Single Day Classics and Grand Tours are such wildly different animals that it's almost impossible to compare them. Being on the road with the Tour de France is like being involved in a completely different life; friendships, politics, heroes, villans, adoring or jeering crowds, a mad travel schedule. The major advantage of the Grand Tours is that given the length of time you have to talk for you can cast your net a little wider and talk about all sorts of topics not just tyre pressures and sprockets. If I had to pick one race a year to go to it would be the Tour of Flanders; the Belgians simple adore their cycling. i note that you write for one or two outlets - is there a book inside david harmon? I've never really considered it, other than writing story books for my young son...who knows! 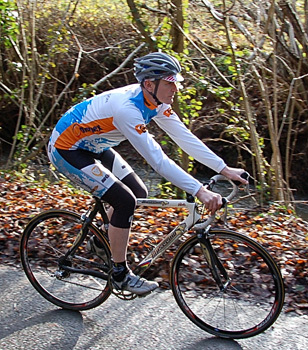 are you a lifelong cyclist, or is this something you came to in your adult years? I didn't even start riding serious until I was 20 and then after failing to become an MTB legend I had about a five year lay-off before I even looked at a bike. When I first tried to climb a decent hill after five years, I was physically sick. 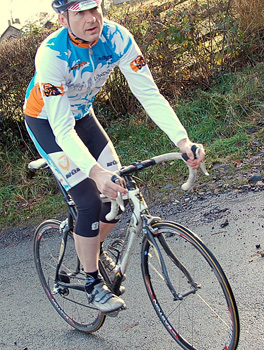 Thankfully careful encouragement by Sean Kelly has kept me riding. I wish I'd discovered road riding as a kid, I think I would have been better on the road than off, to be honest. bearing in mind that you passed me at a rather alarming rate of knots in last year's braveheart ride, i take it there has been racing in your career? 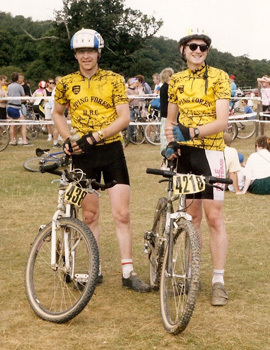 Yes, I did my first MTB race as an independent rider and a guy called Kerry Rochester approached me afterwards and asked me to join the Epping Forest MTB Club. It was a great time, we had the first amateur national champion in Paul McWalters and Darren Barclay was a junior rider with us. I ended up racing on a Kona Hei Hei, what a classic bike that was, coached by ex-Olympic coach Dave Smith. i heard tell that you have become adept at frame building - any harmon frames in the future? No, not frame building...that's the next step! I am a qualified bike mechanic and although it seems to have taken an age, I have just finished refurbishing the workshop at home. It's the equivalent of a potting shed I guess. tell me about Torque Media? My ex-wife and I set up Torque Media back in 1997 as a television production company. I've made programmes for Sky Sports, Channel 4 and the BBC in all sorts of subject areas, not just sporting, and ran the midlands camera crew for Channel 4 news for a while, but when the commentary took off, the programming got shelved. I still have all the kit, but I haven't pitched for a programme in years. will tm concentrate solely on the cycling arena or is there room for lateral movement? To be the best in your chosen field I think you have to live, eat and breathe it but that isn't always easy - it can take over. And as I've had a young family later in life, I don't want that. Conversely if you don't have dreams and aspirations you will never improve. I have some cycling PR contracts outside of the commentary, including The London-Paris Cycle Tour, Dragon Ride, and Museeuw Bikes, which are challenging and enjoyable. how did you become involved with the london - paris ride? I met the organiser Sven Thiele at a launch for the Sigma Sports Team in London, and it's just grown from there. It's an exceptional concept and Sven is one of the most dynamic men I've ever met. how many bikes are in the Harmon bike shed? Too many according to my wife and she's probably right! I have a Hewitt road bike, a 1954 Flying Scot, which I intend to restore and ride on the Eroica, A Revell Romany, a knacked old tandem, a Dawes Ranger, my race Kona Hei Hei, an Alfie Webb Fixed, a Kirk Precision, an all plastic Itera, and of course, my Museeuw MF1. I'm tempted to say I have it already. The Museeuw is an awesome machine; Brian Smith has just got one too, but I guess if I had to choose another bike I'd like a vintage Rene Herse. I'm a very lucky man, I used to watch Sean on the television with Kerry and the boys, and he was our tough guy hero. But from within the MTB world it has to be Ned Overend, John Tomac, Mike Kloser and Sheffield's Finest - Dave Baker and Tim Gould. 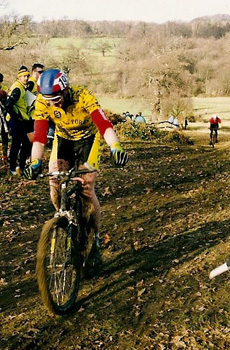 I can remember meeting Baker and Gould on some Godforsaken windswept hill in the Peak District when I was out on my MTB and they where out on their cyclo cross machines. David told me to 'get a proper bike' but within 18 months they were beating the very best the rest of the world had on MTBs.